Today the server this site runs off got a well needed upgrade in the form of a Raspberry pi model 2B. I’m normally not one to rush out and buy the latest new gadget; my policy is if it aint broke don’t fix it. However wordpress had been taking it’s toll on the trusty old model B, and the timing of the 2B was perfect as I’d even started considering getting proper hosting again. 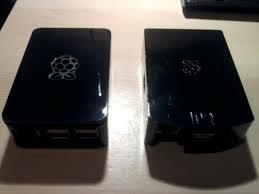 Raspberry pi model B2 and B side by side. I thought the Qube2 was an amazing little server. This entry was posted in Cobalt Qube, Hardware, Raspberry pi and tagged raspberry pi upgrade on February 15, 2015 by Glyn Astill.